I’ve talked to several friends that have said, “I can’t do art.” “I haven’t done art since junior high.” “You can do art, but I can’t.” When did we stop doing things that we were only good at? Why do we feel so vulnerable trying to do something creative? I grew up in a home where my grandmother was an artist. Nana would take each grandchild one at a time and do art with us. One of my cousins shared the story that he never completed anything. Nana worked with him and even though he stopped and started she took him back to the art again and again. Donnie shared what it did in his heart to actually finish something and see his art. 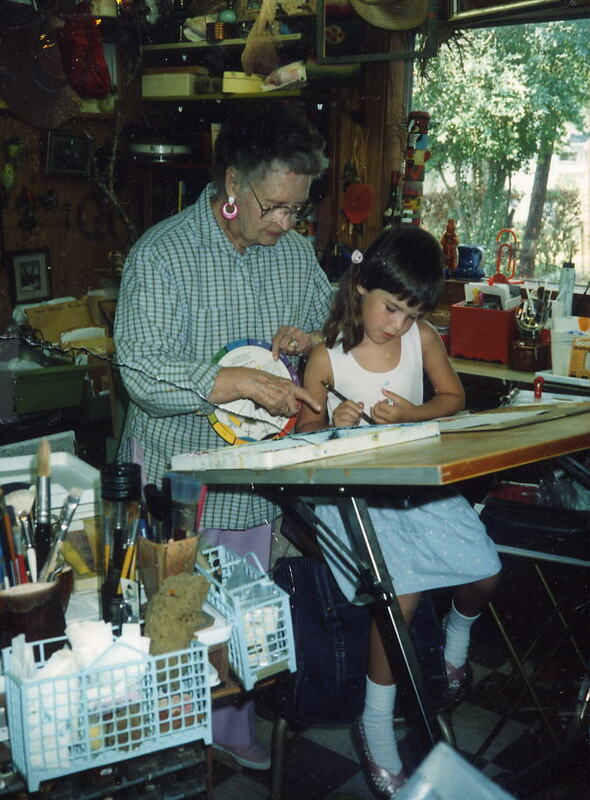 I’ve attached a picture of Nana doing art with my daughter Stephany. Even with that encouragement in my life to do art I find I’ve had patterns of quitting art. I’m trying to change this in my life and influence others to give themselves permission to be creative. If you give a child art supplies they just dive in. As adults we’ve learned we don’t want to do things we can’t succeed at. What if you just gave yourself permission to sit down and do art for even 15 minutes? I had a friend over this week and Ali said she hadn’t done art since she was in junior high. We sat down to draw. She picked the hardest thing in my house to draw, an old fan. She kept telling me how bad she was, but I saw that as hesitant as she was to draw she did an amazing job. She showed up and began. What could you give yourself permission to do today? Could you risk scary to sit down with a picture from a magazine and try drawing for 15 minutes? Could you get one of those new adult coloring books and just spend some time coloring? Could you try creating a new recipe? Could you sit down andwrite? The real question is will you risk creativity and the vulnerable place that creates?